Photoshop Elements provides Organizer preferences that enable you to specify different organization settings as you work in Elements. When you’re setting the Organizer preferences, you’re setting preferences for the Organizer only. To take a quick peek at the Organizer, click the Organizer button at the top of the Elements window while in Edit Full or Edit Quick mode. There are two Preferences dialog boxes. One Preferences dialog box is available in the Edit Full mode workspace, and the other is available in the Organizer workspace. This article covers the Preferences dialog box that you open from the Organizer workspace. You can open the Organizer Preferences dialog box after opening the Organizer. Choose Edit→Preferences (Windows) or Adobe Elements 9 Organizer→Preferences (Macintosh) or press Ctrl+K (cmd+K on the Macintosh) in the Organizer window to open the Preferences dialog box. Press Ctrl (cmd)+0 (zero) to open the Organizer from within a Preferences dialog box in either editor to gain access to the Organizer Preferences dialog box. 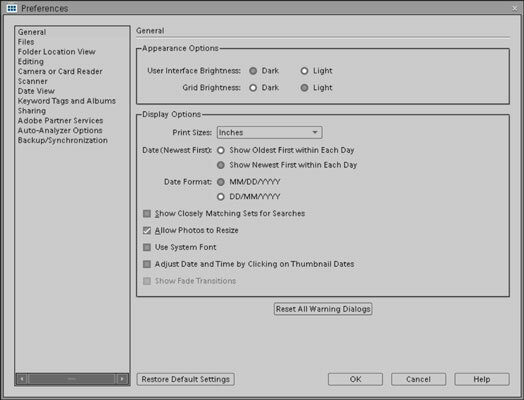 Choose Edit–>Preferences–>General to open the Organizer Preferences dialog box shown here. Restore Default Settings: Click Restore Default Settings to change all panes to their original defaults. OK: Click OK to accept new changes. Cancel: If you click Cancel in any pane, any changes you made aren’t registered. Help: Click Help to open the Help window and find information about Organize & Share preferences. General: These items affect a miscellaneous group of settings that are applied to files when you’re using the Create tool. You also find settings for changing the Interface Brightness from Dark to Light. Files: Here you find options for managing file data, connecting to missing files, setting prompts to back up your data, saving catalogs, choosing file and folder locations for saved files, rotating images, burning CD/DVDs (Windows only), and handling preview sizes. Folder Location View: These are options for showing files and folders in groups and selected folders. Editing: You can enable another application that provides some editing features not found in Elements to edit an image based on its file type. An example for adding another editor is when you’re editing video clips. If you have Adobe Premiere Elements, you can add Premiere Elements as another editor. Or, you can use another editor, such as Windows Movie Maker (Windows) or iMovie (Macintosh). Camera or Card Reader: Here you can determine how to handle acquiring images from digital cameras and media storage cards. Your computer may have a built-in card reader in which you can insert a media card, such as CompactFlash or Smart Media, or a USB card reader that supports a media card. In other cases, you may have a cable that connects from your camera to a USB port on your computer. Scanner (Windows): If you scan images with a scanner connected to your computer, the Scanner preferences hold all the options you may want to set. Date View: View files that you can add to the pane or from selections for a variety of holiday dates. Keyword Tags and Albums: These preferences help you find and sort your images. Tag preferences offer options for sorting tags and icon views for tags. Sharing: The options on this preferences pane relate to sharing files via e-mail. Options are available for setting an e-mail client and adding captions to e-mailed files. Adobe Partner Services: These preferences offer choices for handling program updates and online service orders. You can choose to check for program updates automatically or manually, choose options for printing and sharing images, and specify how you want to update creations, accounts, and more. Media-Analysis: Media-Analysis performs automatic analysis of media in a catalog — things like analyzing photos with people in the images. You can turn off Media-Analysis in this pane. Backup/Synchronization: You have a choice here to sign in with your Adobe ID account. Once signed in, you can back up photos to your library on Photoshop.com.